How fit is your… Voice? Me and Hernan. BODYCOMBAT 38 workshop 2008. If you’ve been on any social networking sites in the last 24 hours you’ll have heard the terrible news that we lost someone very special yesterday; Hernan Lopez. I’ve been sitting at this computer trying to think of a way to articulate this loss and I’ve decided there’s no possible way I can do it properly. Right now everything is numb, I’m sad, so I’m just going to keep this short. Quite simply Hernan was a true Les Mills BODYCOMBAT warrior – he appeared on 7 DVDs (more than any BC presenter besides the Programme Directors to my knowledge), and for good reason. 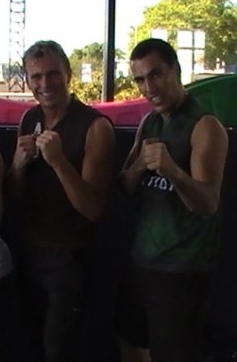 Hernan was the epitome of what BODYCOMBAT should be. He was an amazing talent. Straight after the AIM I wrote a post and mentioned that my absolute favourite instructor in the world is Hernán López. His classes are fantastic! Yes they are high energy, and motivating, but they are also fricken hysterical. I mean, if he wasn’t a group fitness instructor the guy should be a comedian. Even if you’ve seen Hernan on the DVDs (where yes he is funny “Kung Fu Panda” anyone??) he’s even more hilarious in his own classes where he’s not quite so scripted. They are just so much fun. Hernan was truly my BODYCOMBAT hero. Whenever I made a trip to Auckland I’d always try to make his class. I found the fact he mixed working hard with humour so inspiring. The hour just flew by as you were just having such a party. And now the party is over. I first heard about his passing last night at about 10 or 11pm. Given it was late and I had an early morning Combat class I pushed it to one side of my brain, almost pretending it didn’t happen and tried to sleep. The first thing I did upon waking was check my phone. I had been inundated with facebook messages, tweets and texts asking if it was true. Again, I pushed the thought to one side – I had a class to teach. In Hernan’s honour I taught Mortal Kombat (one of his DVD tracks) with his signature ‘air guitar’ – I got through the class okay. Left the stage to go get changed to participate in a BODYBALANCE class. I never made it to that class. In the staff bathroom the adrenaline left my body and I broke down and sobbed for a good 20 minutes. I suspect from the hundreds and hundreds of statuses and comments on facebook my experience was not isolated. With the filming of BODYCOMBAT 52 just two days away it’s my hope that Dan and Rach will make the release a special tribute to him. Hernan I suspect you never knew just how much you were loved – worldwide – by literally thousands and thousands. I don’t think you knew how many lives you touched. And how many people you inspired just as you inspired me. BODYCOMBAT instructors and indeed the entire LM tribe around the world are in mourning. You left us with some amazing memories; I’ll never forget BC40 with Tanya Walker and “Sweet corn”, your Kung Fu panda impressions, the gas mask in B44, your infectious laugh and smile. You were an incredible instructor and an amazing guy. Gone too soon but never forgotten. We love ya bud. 52 Responses to "The Les Mills Tribe has lost a true warrior"
If you have a moment check out Raina’s blog post here – the picture is classic. DAMN!!! I actually thought that Dan was gonna quit. But after the cooldown it was obvious it felt more like a tribute. After viewing the DVD I found myself crying. Odd feeling. I felt everyone’s pain through my TV. Dan, Rach, Please continue on in his memory. Stay with the fight!! Incredibly sad news! He was also one of my favourite bc instructors because he made the classes so funny! He even made Numa Numa fun!! “telefono brrring brrinngg” tragic loss! A fitting tribute to an amazing instructor and phenomenal character; beautifully written. And I double what Raina said, if it hadn’t been for you and Raina would never have come over in the first place, you guys have a special spot in my heart. Thanks Tony. Been a tough day for the tribe but has reminded me of how close we all are – we’re brothers in arms fighting the same cause. Cheers my friend. I first encountered “Captain Colgate” on BC34. The rest is history. May you RIP Hernan. Even though I never attended an actual class he taught, I enjoyed watching him on DVD. Friends of mine who have attended Hernans classes have spoken about how friendly he was. Wow, how sad to hear of his death. He was one of a kind Placebo – an amazing gentle person. Sad day for all. It’s hit a bit hard for me Glen, as this is the second Combat Presenters death – Jenny Chen. Both of them taught with humour and a gentleness, that was somehow strong. I know you knew him personally, big hugs to you. You’ll do him proud in your next class, I will too. What a terrible loss. I’m not an instructor, so I don’t know who Hernan is. But he sure sounds like a top bloke and the kind of person you go out of your way to attend his class. If you would like to show your respect to a man who inspired a lot more people than he ever realised in the Bodycombat world i have created a Twibbon which can be added to Twitter or Facebook pictures to honour our friend. Beautifully said, Glen. I can’t even imagine myself how you guys feel, you knew Hernan. I live far away from NZ, I “know” Hernan only from dvd’s and I thought if I’ll even make it to NZ, I’d definitely do my best to witness his class. And I was crashed with this news which I’ve read on Dan’s FB page (that’s why I knew it was true), I couldn’t stop my tears running down and now again I can’t help crying. How deep can somebody touch and inspire people when even those who’ve never seen him in person, feel so much pain of losing him. I think of Dan& Rach, of you, Glen – I’ve rushed here first thing in the morning ( it’s morning 28.01 here) , I think of all those people who knew Hernan – his family, friends. my thoughts are with those people. The tribe has lost the precious member, let’s all stay with the fight – for him, he is (somehow I can’t say he was) he is an amazing role model for us, he inspired us, and he’ll never be forgotten. Wonderful tribute, he will be truly missed. Thanks for sharing Glen, I know exactly what you mean and I felt the same way about him, even though I met him less than a dozen times, he made such an impact on me, and his classes were awesome, even if he did make us do press ups for getting the choreo wrong!! 🙂 He was special, like you say a true warrior, and a legend to me. R.I.P. brother Hernan. Very touching post, Glen. I didn’t ever get to meet him, only saw him on BC DVD’s, but I enjoyed his humor, his obvious love of life, and that smile that seemed to go on forever. A life lost too soon, the Les Mills tribe will miss their warrior. My condolences to you, as well as the entire family. Marilina thank you for your kind words. We are all so sorry for your loss. Your Son was an incredible man cherished the world over. Thank you for taking the time to write, my heart and thoughts are with you and your family. This is Hernan’s mum, Marilina, I just read your articule, and I thank you for your good memories about my son, you described him just as he was… his absence will be painful for us, but as a tribute to him and his way of being, we MUST go forward… he was inspirational, as his family we are nothing but PROUD of him, thanks again for your beautiful article. Omg Hernans mum just posted on here. I was priviledged to have spent many hours chatting and drinking coffee with ur handsum Colgate smile son. Last time was just 2 weeks ago. I feel the pain of his passing. You’ll never be forgotten matey. Hey Glen. Your words are spot on – I really don’t think Hernan realised how many people he inspired. He really WAS hilarious, and he was also dedicated and passionate about what he did. To say he will be missed is an understatement; he is a talent that will never be replaced, and we at LM will miss him for a very long time. I’m not a combat instructor and have never met or even seen a class of Hernan’s- I didn’t even know who he was before this sad news. Something I regret. But I am part of the LM tribe, and I do know how close the LMNZ family is. I can see how amazing Hernan was by the way his passing has rocked the LM community worldwide. I know how hard it has hit over here in London, so can only imagine how it is for those close to him. I’m deeply saddened that the world has lost such an inspirational leader and obviously special person. My thoughts go out to all those who knew him, were touched by his light, and lifted by his amazing talent. Perhaps he can continue to inspire if we use his memory as an example of the type of person we should all strive to be. Strive toward having such an impact on the world, that no matter whether or not people know us, our passing will rock the LM community, and indeed people every nation. And remind us all that we are one tribe. He was a truly inspirational person. Such sad news. I would rearrange my schedule to go to his classes because they always put me in a great mood. Such a loss for the world. He was such a positive light in the world. Sad. Such a sad loss. He will be remembered world wide. I had the great opportunity to meet him in the global summit 2008. I’m chilean so we spoke in Spanish the whole time and laugh about our typical bad words from our countries. I met his brother too to whom i spoke recently. He’s fighting just because so many people love his brother. My heart goes out to you Marilina and the rest of the whanau (family). I met Hernan about 3 years ago at a Team Teach BC night, the first thing I remembered was his very unusual sense of humour, something you hardly see from any instructor. Because we both had Tae Kwon Do backgrounds and I use TKD kicks and strikes in my BC, he kept hassling, prodding and commenting at me through the class. I first thought, “Who the hell is this guy” but later on I chatted with him and found he was such a great guy, a bit cheeky but very confident and funny. He just cracked me up so much. Even since then I always tried my best to attend his classes when he was teaching, and found them to be the very best classes available. Hernans passing is a huge loss, a man with so much to give, so many friends and so much passion in whatever he does. I, like many, am extremely grateful to have known him, and am so sad to see him go. Farewell, my Colgate Smile brother, you are deeply missed. Thank you Marilina for raising such a great young man. I’m not a combat instructor. I knew about Hernan only from his BC DVD’s. I like his humor. He was a special person, a legend and a true warrior. It is such a sad news and a loss for the LM world. Tears…. You’ll always be in our hearts ! I’m not a combat instructor. I knew about Hernan only from his BC DVD’s. I like his humor. He was a special person, a legend and a true warrior. It is such a sad news and a loss for the LM world. Tears… You’ll always be in our hearts ! 32 | Dilly Clark. UK. Beautifully written Glen. I have been offline all weekend and a couple of hours ago I caught up with this sad and tragic news. I first met Hernan at the filming of BC40 and what a character! I feel so sad for his family and friends. We have all lost someone very special. this is kinda a stupid question but, what cause his death? i’m not a bc instructor so i might not know much about him, but he is so loved all over the world. I’m really proud I met Hernan as my instructor in Mexico, and as you wrote, for me he was also one of the best BC instructors I ever met, he inspired not only me also my family, and it was an honor for us experienced BC at his classes, those were absolutely the most amazing and funny classes, now my family and me have incredible memories of him. The last time we could seen him was in 2007, at his last Mexico BC class before he go to New Zealand, yesterday I was looking between my old pictures and films and I found some pictures and films of those moments and I would like to share them for the people who didn’t meet him in person and for those who did know him; for remember he was an amazing human being. thanks a lot for sharing this post and a lot of real feelings shared for our greatest hero in BC! OMG!!! And I was having a good day up to now where I started reading the BC52 filming and first read the unfortunate news!!! May he be in peace and know how much we will treasure him as an instructor and most of all the person he was. Once again congratulations nzglen for the wonderful tribute and bringing the news (even the bad ones) in such a professional manner to the fitness nuts like myself who live LITERALLY across the globe. I can hardly hold back the tears! I have not taught Combat in some time. I decided to “retire” to devote more time to Pump. I have not even come hear to read about any releases prior to getting them. So this is the first I have heard about Hernan. My heart is so very heavy now. I put on my favorite release the other day which is Combat 40 and did not know that Hernan was gone. I will miss him.